" " wisno wood furniture finishing: UV coatings for wood flooring. 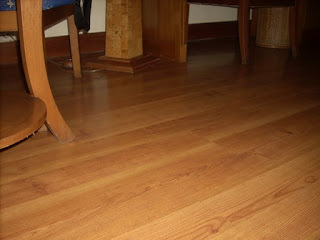 UV coatings for wood flooring. UV coating (UV cured coating) is the most widely used finishing material for wood flooring. UV coating can produce a finishing layer with very strong film layer. its film is hard, and has high resistant to scratches, heat, solvents and chemicals. It is proper material to finish the wood floors. Floor as the base of the house should be able to withstand the weigh of every items placed on it. Floor also has to accept the activities of the inhabitant in the house. The floor also needs to be swept, mopped and cleaned that is done with water, soap or chemical. Since that it needs a special finishing layer with high resistant to the water, solvents and chemicals. UV coating can produce a strong film layer that fulfill required by the floor. It can also be applied with very high efficiency by using roller coating machine. Wood floors are always in the form of a flat panel that is very suitable with the roller coating machine. There are many type of UV coatings have been developed and available in the wood coating industry, but now the most uses is the UV coatings for flooring. It is the UV coating that is specially design to finishing the flooring. UV coating for floor is already well known since long time, even the UV coating is very identical with wood floor finish. It is the UV coating type that can produce the hardest and strongest dry film. The major disadvantages is that the coating will leave roll marks on the resulting film layer. Even with the advanced technology of wood coating today the marks has become less visible and vague, but of course it won,t produce a smooth and flat surface as the coatings applied by spray. The UV coating usually is applied with a roller coating machine. The machine usually is a series of some machines to do the application continuously. It consist a roller to apply the coating, UV lamp oven to cure the paint and wide belt sander to do the sanding between the process. The wood panels that enter the machine follow the continuous finishing process. Exit from the machine in the wood panel is already finished with dry coating layer and ready to be used. The process of finishing to the wood flooring is usually as follows: stain, UV filler, UV sealer and UV top coat. The stain used is usually water base stain which is applied by a sponge type roller. The stain is also can be applied by spray outside the machine line. The sponge roller as the first coater is usually equipped with heat oven to facilitate the drying process of the water base stain. The application of filler, sealer or top coat is done by using a rubber roller and always need to be followed by the UV lamp oven to cure the coating. Too thick layer of sealer and top coat application should be avoided since it will leave roll mark; the thicker layer the more obvious roll marks is left. Therefore, in the wood flooring industry, usually we needed several times application of sealer and top coat to minimize the roll marks. UV paint coating will never be dry if it is not lighted by UV ray with enough intensity. Every application of uv coating always need an UV lamp oven. The intensity of the UV lamp oven can be adjusted according to the curing needed. There are three types curing of the UV coating: semi-cured, surface cured and fully cured. It is a state when a uv coating has not dry. The coating film obtained cannot be thinned with thinner but it is still soft. The film layers will be peeled off when scratched strongly. The semi cured film cannot be sanded. The semi cure is prepared for the film that will be layered with another UV coating without sanding operation. Is a condition where the surface is dry but its film has not reached its maximum strength yet. The coating film can still be scratched. The surface coating is used when we need do the sanding to the coating layer. Some finishing process require certain type of sanding sealer that need to sanded to produce a finishing layer with strong and even film layer. Each film layer that need to be sanded should be dried in the surface cured state. It is a condition in when the coating layer has produced film layer with its maximum strength. The finish film is perfectly dry and will be very strong and hard. The fully cured is needed on the final top coat application. The fully cured on the sealer will make the sealer become very hard and difficult to be sanded. A fully cured coating should not be re coated without a good sanding process. Every re coat operation on the fully cured UV coating should be started with a good sanding on the film layer, otherwise a poor film adhesion will be obtained. Its moment Wood floor sanding establishment characteristic has gotten consideration of numerous DIY-aficionados to increase the value of their property by introducing such ground surface with different outlines (contrasts from the sorts of hardwood species utilized) including hickory, oak, bamboo and maple wood flooring.